A 3 night/4 day Immersion in beautiful Glastonbury, the isle of Avalon.... Yoga, Meditation, 6 hour New Year's Eve Kirtan, Fire ceremony, nature walks & much more. A positive, nourishing & uplifting start to the New Year. We have been running retreats for many years at Shekina Yoga Retreat... it is certainly one of our favourite places. 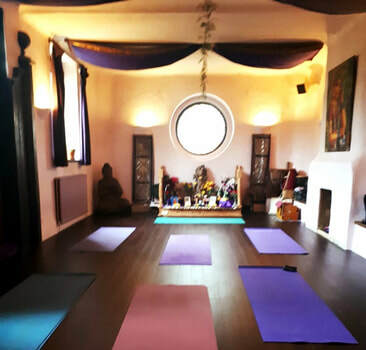 Very quickly the relaxed atmosphere settles you into your retreat... the primary focus is you... its your time to immerse into traditional yoga practices such as Hatha Yoga, Meditation, chanting mantras, kirtan (devotional singing). Lila will be hosting the retreat and looks forward to welcoming all of you. The retreat is open to all levels of practitioner. Have a look below for our full and varied daily programme. The surrounding countryside is lovely and we are just a short walk away from Glastonbury's legendary Tor and the historic town centre. Escape from the often hectic New Year Celebrations and begin the New Year in a positive and nourishing way. On New Years Eve we will welcome 2019 in with 6 hours of continuous kirtan (devotional singing) from many well known kirtan musicians and singers. It will be both a meditative and uplifting, joyful evening, We invite you to open your hearts and voices in celebration... dancing is welcome too! The New Year's Eve programme is open to the local community from 6pm to midnight and is always a busy and happy event. On New Years Day we will have a purifying fire ceremony otherwise known as a Havan / Yagya. This is an ancient practice where mantras are offered to the fire. Fire purifies and our offerings all help to seal our intentions for the New Year ahead. Flowing traditional hatha yoga sessions will naturally open the heart and nurture you to a space of surrender and stillness. Practices will be intuitive, strong, deep and supportive and cater for all levels from the novice to the seasoned practitioner. The morning class will be Hatha Yoga / Sivananda style practice and the afternoon will be a Yin / Restorative gentle practice. A typical class will include asana (postures), pranayama (breathing exercises), guided relaxation, chanting and a taste of philosophy. The schedule also includes practices within Bhakti Yoga such as kirtan, puja and devotional chanting of mantras. There will be a few inspiring gems about yoga philosophy too. There will be plenty of time for you to indulge in a massage or you may like to relax and detox in the sauna or simply curl up with a book, the choice is yours. Please see below for an example of the retreat schedule. The schedule may change slightly as necessary but arrival and departure times will remain the same so as you can book your travel accordingly. 6 hour non-stop Kirtan begins. 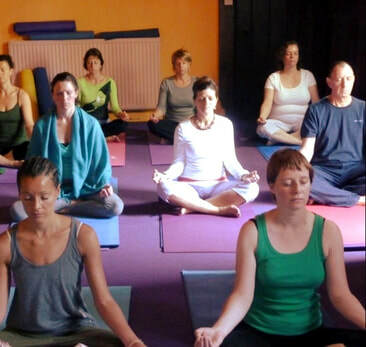 Shekina Yoga Retreat is situated on the side of Chalice Hill, and has been a hub of activity in Glastonbury since its inception in 2003. It is a place of retreat and celebration both peaceful and dynamic, the ambience here is homely, relaxed, grounded and is focused on living consciously, peacefully and truthfully. 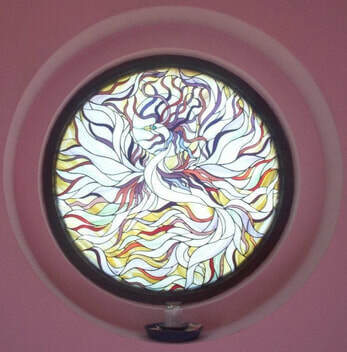 This is a place to take rest, reflect and journey deeper into your spiritual practice. As a spiritual community, Shekina Yoga Retreat is a western evolution of an ancient tradition where sacred space is created away from the world where individuals come to both cultivate and draw upon spiritual sustenance. We will do our best to accommodate your needs, please let us know. Although its name is now synonymous with the massive music festival that takes place in the nearby village of Pilton, Glastonbury is a peaceful English town shrouded in a mystery all of its own. Glastonbury Tor rises in the distance, topped with a ruin of a 15th century church. This area is protected by the National Trust, and provides a memorable walk from the town centre. From here visitors can enjoy stunning views of the surrounding Somerset countryside, including the Ham Wall National Nature Reserve. There's a great deal of mythology surrounding Glastonbury, with some believing it has connections to everything from King Arthur to the Holy Grail. There's certainly an alternative vibe to this quaint market town, and the spirit of the 1960s remains in its multitude of crystal shops and new age bookstores. Glastonbury's lengthy history can be explored walking around its well-preserved town centre, which is home to a number of secluded churches and a town hall dating back to the early 1800s. There will be an opportunity to walk up the Tor and to fill your water bottle with the refreshing white and red spring waters. Chalice Well Gardens and The Abbey are also worth a visit if you fancy a little explore... there is an entrance charge for both places. Glastonbury has a number of good cafes, a couple of supermarkets and plenty of new age shops. 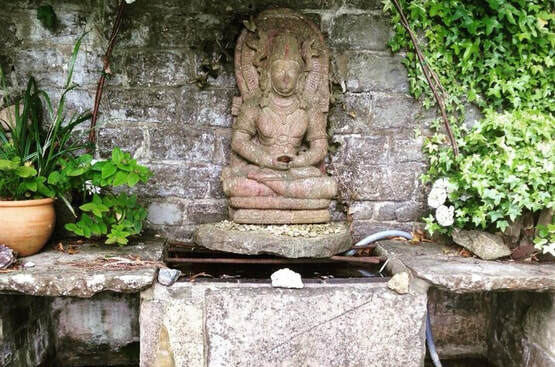 Shekina Yoga Retreat is situated on Dod Lane in Glastonbury, just a few minutes from the Chalice Well. There are regular buses into Glastonbury from Bristol and Bath (approx. 1 hour away). We would advise travelling by train into these stations, and then taking a bus from there. If you are taking the train to Castle Cary, the bus service is sparse and a taxi to Glastonbury costs around £35.00. Arrival time on Saturday is from 3pm. The retreat will close after lunch on Tuesday 1st January, around 1.30/2pm. Please email us for a booking form. Once we receive your completed form and payment we will confirm your place. Places are limited on the retreat - we suggest you book early.